Kathy Calvin reported that there will be a Kiwanis KARES reading on Tuesday, February 5th at Elm Street School starting at 9:30am. 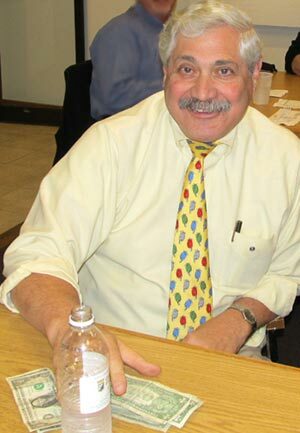 However, because she is unable to be there Joe Adrignola will be leading the effort. Joe is looking for volunteers to help. If you are interested please let him know. Betty Ballantyne let the club now that she is currently looking for programs for future months so please keep an eye out for individuals or organizations who might be interested in coming to speak to us. If you have any ideas, please send her an email by "clicking" here. For the meetings of January 28th and February 11th, we meet at Laconia High School in the Huot Technical Center restaurant. The Laconia Key Club will be our hosts. For directions to the Huot Technical Center restaurant, "click" here. This is the place to be for our next two meetings. President Scott led a discussion regarding fundraising activities in the upcoming year. Different ideas were discussed; four prominent activities included Gaming at Lakes Region Casino, Home Run Derby, Bike Week Boardwalk and Rogers Ride. An initial organizing meeting for the Home Run Derby was set for 6:00 pm, Thursday, January 24th at 780 N Main St., Laconia (Central New Hampshire VNA & Hospice). Everyone is invited to attend. 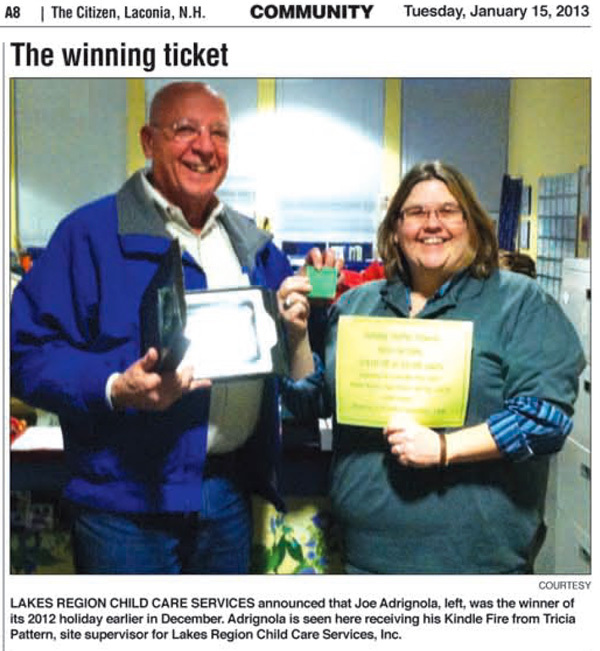 Brian Winslow and Jack Batchelder reported that dates are set for Laconia Kiwanis Clubs' 10 days at the Lakes Region Casino. Currently we are scheduled for 10 days mid-March. We are actively trying to get additional days at the Casino to enhance our revenues. Brian Winslow warns the club against its dependence on fundraising through gaming activities. With expanded gaming in NH a distinct possibility, and our current Governor outspoken with regards to only letting one Casino in Southern New Hampshire expand, the viability of Lakes Region Casino is threatened. 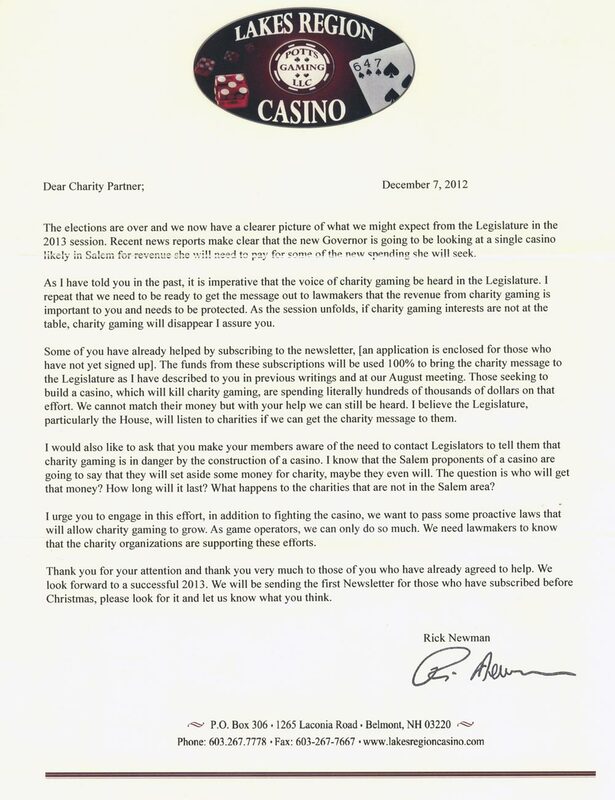 For more details, you can read the related letter from Rick Newman of Lakes Region Casino by "clicking" here. Many thanks to all the Kiwanis members who braved the elements to ring the bell for the Salvation Army on Friday, December 21st. Although the temperature was in the 40's, most of the day it rained very hard with winds gusting to 40 mph. Umbrellas were all but useless as most volunteers were pelted with a horizontal stream of rain drenching many to the bone. 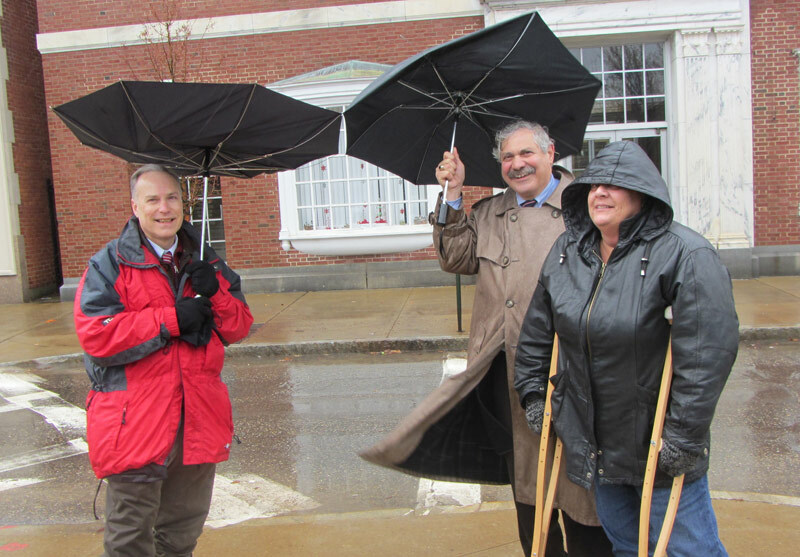 Scott Beane, Phil Bonafide and Lori Dickson were just a few of our members to brave the wind and rain to ring the bell.